A lot has been said about graphene transistors, and how they might one day enable the creation of computer chips that are hundreds of times faster than the current crop of bleeding-edge silicon-based parts. With silicon fast running out of steam and no clear path beyond 14nm, graphene might just be the light at the end of the tunnel. For that to occur, though, we first need to turn graphene into a reliable semiconductor; the world’s greatest chemists and physicists need to get together and work out how to switch graphene off. This is proving to be a lot harder than it sounds — but now, thanks to a fancy effect called negative resistance, researchers at the University of Riverside, California (UCR) may have cracked it. All semiconductors, whether we’re talking about silicon or a fancy III-V material such as gallium arsenide, owe their semiconducting properties to their bandgap. A bandgap is essentially a certain energy difference (measured in electronvolts), up to which electrons cannot flow across a material. As long as the voltage difference remains below a certain level, the material acts as an insulator. At a certain point, though, the energy difference reaches a point (the band gap) where there’s enough energy to knock free the outer shell electrons of the material, creating a sea of electrons that act as a charge carrier. In other words, when the band gap is crossed, the semiconductor switches on. Unfortunately, graphene doesn’t have a bandgap; it’s just really, really conductive all the time. This might make it useful for other applications, but certainly not transistors, where semiconducting properties are utterly essential. 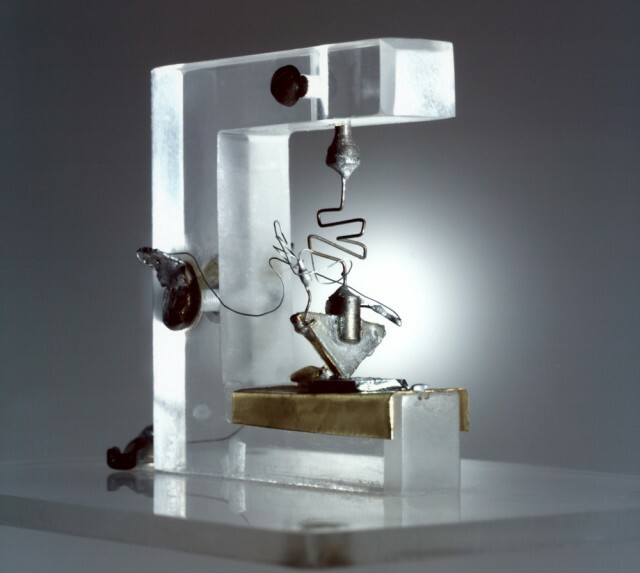 (The image above, incidentally, is the first ever transistor produced by Bell Labs in 1947). Research groups all around the world are currently trying to induce an artificial bandgap in graphene, usually through doping or mechanical strain, but these approaches have all been met with varying levels of failure. Taking a different tack entirely, Guanxiong Liu and fellow researchers at the University of California, Riverside have designed a graphene transistor that does away with the bandgap, instead relying on a new phenomenon that hasn’t been used by transistors before. Basically, under certain conditions, an increase in current entering a piece of graphene can (counterintuitively) cause the voltage across the circuit to drop. This dip in voltage, called negative differential resistance, can be used to perform logic, kind of like an inverted transistor. 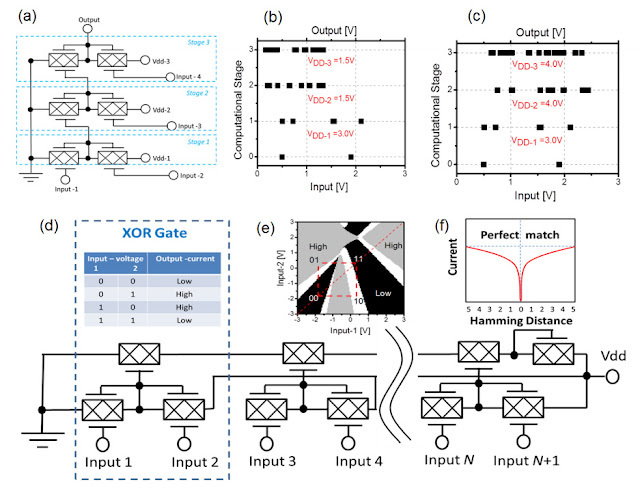 According to the Riverside researchers, logic gates (and thus complete chips) built from these inverted transistors could be much denser, more efficient at some tasks, and operate at terrifying speeds (400+ gigahertz). Now, of course, they actually have to actually build a circuit out of these inverted graphene transistors. 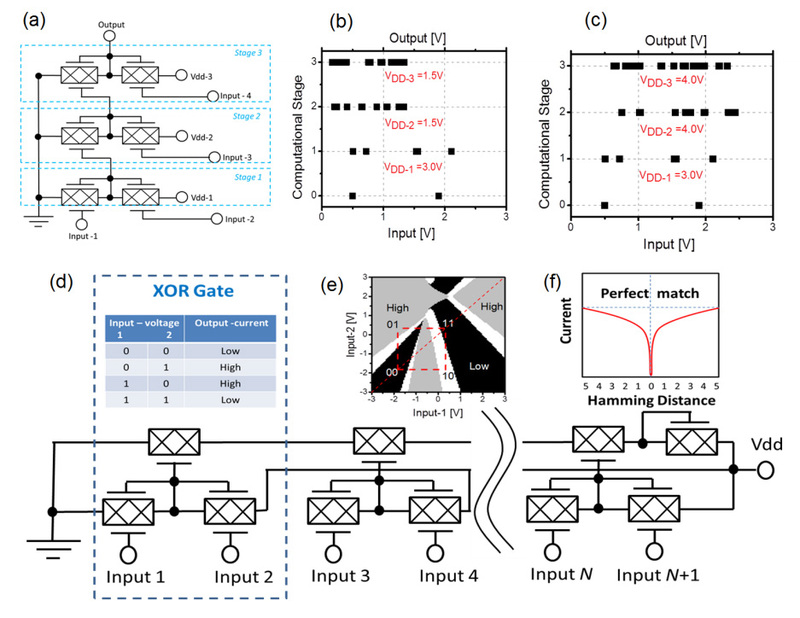 They have experimentally proven that negative resistance occurs in graphene, but now they need to build some XOR gates out of the stuff. If it pans out, according to the researchers, this “may lead to a conceptual change in graphene research proving an alternative route for graphene’s applications in information processing.” In short, 400GHz graphene transistors are now a distinct possibility — though, as always with any non-silicon-based tech, it will take at least another 10 years until we have the machines and expertise to build graphene-based devices with the same level of complexity as modern-day chips.